We came across this standing stone purely by accident. After deciding to go back down to Castletownbere from Dereenataggart stone circle to wait for a heavy shower to pass, I spotted this tall slender 3.2 metre high standing stone. The stone sits on top of a rocky knoll, half of which has been quarried out to make way for a small housing development. The stone, which may have once stood quite proud overlooking Bear Island, now looks to be in quite a sad state surrounded by poor inadequate fencing. 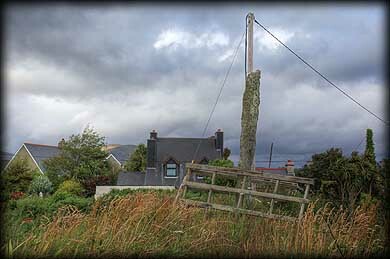 It is also quite difficult to get good images as there is a telegraph pole in close proximity to the stone with several cables extending from the post to the ground close to the megalith. The fifty centimetre wide stone leans slightly towards the south. I would not recommend a visit, unless you were visiting the nearby stone circle. Situated: The is located on the right hand side of the Mill Rod as you head to Dereentaggart Stone Circle from Castletownbere. Discovery Map 85: V 6731 4578. Last visit July 2011.